I set up camp in the park across from the sandy beach in Kisakata, immersing myself in the warm waters of the sea a short time later. My legs were still reeling from the marathon slog up Hayachine just a few hours prior, and I needed to recharge my muscular batteries if I had any chance of scaling the highest mountain in Tohoku the following morning. An early night was in order. The first bus to Hokodate was nearly empty, but seemed to wind its way through every back street before finally meandering through the hairpin turns of the Chokai Blue Line. The modest parking lot housed a large restaurant, a visitors center, and Hokodate Sansou, my home for the night. I dropped off my heavy pack in the lobby, put my name down in the guest registry, and headed up towards the towering volcano with the most minimal of gear. The cloud hung tightly to the steep walls of Naso gorge as I immediately hit a large patch of snow. Little did I know that I’d spend the next 3 hours trudging through the remnants of the fierce Tohoku winters. Up until that point in my journey I’d yet to come across more than just a pint-sized patch of powder, but Chokai’s sheer size dominates the horizon for hundreds of kilometers and, as such, acts as a magnet for condensation throughout the year. I popped out of the slush just below Ohama hut, where I took my first break to admire the beauty and tranquility of the serene crater lake. I could’ve easily spent the rest of the day sitting on the shores, watching the snow fields slowly deposit their wintry runoff into the frigid waters. 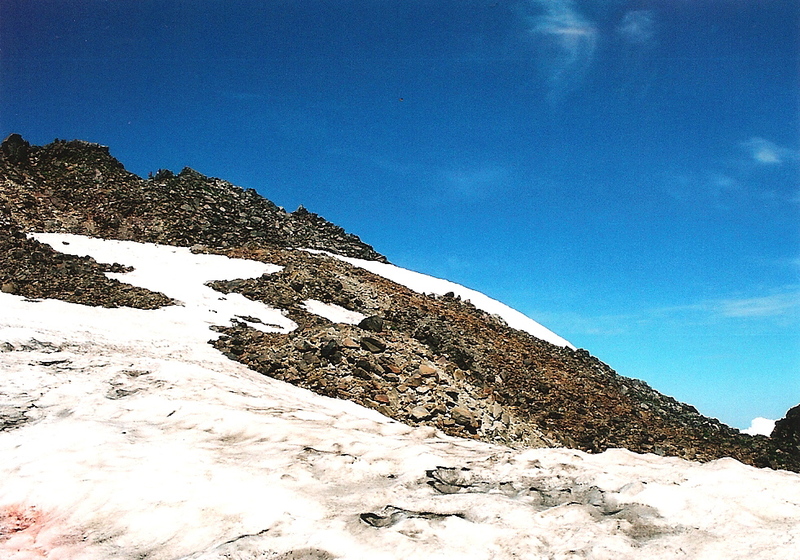 But alas, I had a peak to climb, and the summit rose majestically directly ahead, completely free of cloud cover. A short time later I came across a trail junction. If I went right then I could stay on the ridge all the way to the top of Mt. 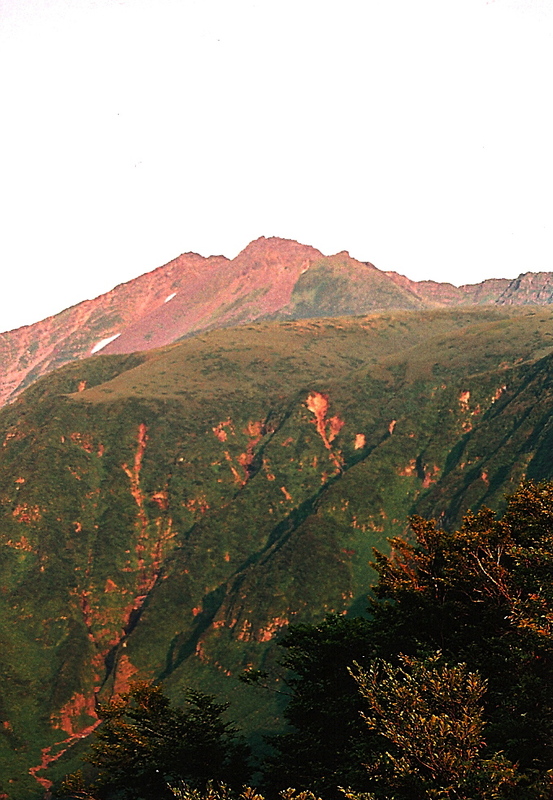 Shichikou, one of the twin summits of Chokai’s rocky flank. If I opted for the left fork, then I could climb directly up to the high point of Shin-san. 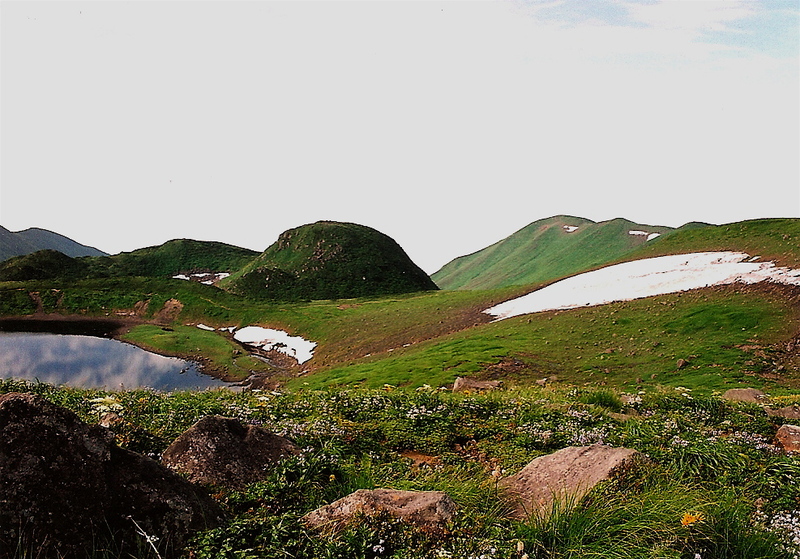 I was immediately drawn to one of the most picturesque cols in all of Tohoku, and the left trail dropped directly into the line of fire, knowing I could later descend via the ridge. There’s nothing more I enjoy then marching through a river of snow in the middle of summer: the cool air lifting magically off the frozen surface, the contrast of the lush greenery all around. 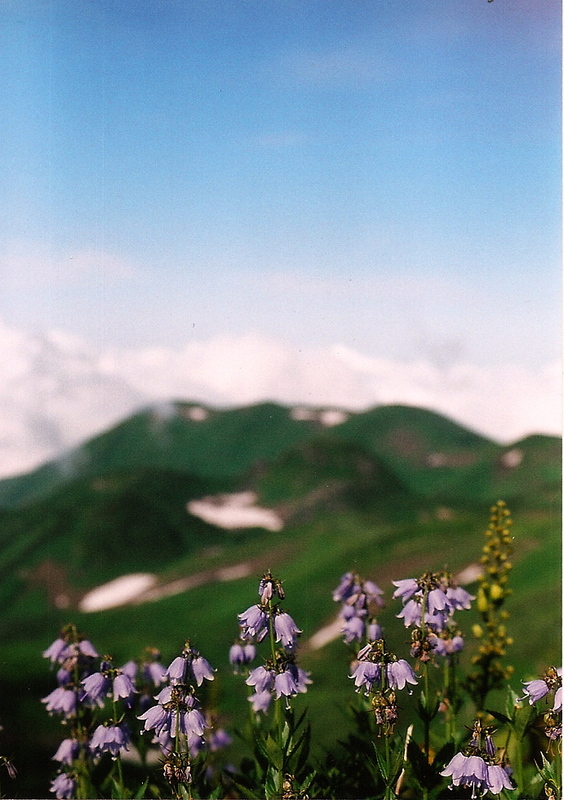 Chokai was quickly becoming my favorite peak in northwestern Japan and I was only starting my day. 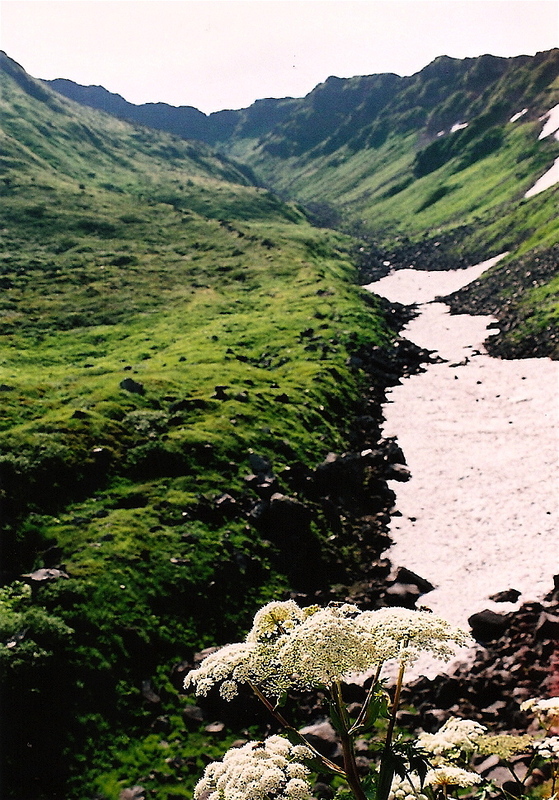 Upwards and onwards I rose, leaving the refreshing confines of the col and crawling through an immense boulder field. The path got steeper with each advancing step, but eventually I found myself sitting on the doorstep of the monster of a hut just below the final push to the summit. “We’ve got no water. You’ll have to buy it,” scowled the stern seasonal employee, pointing to a large cooler of ridiculously over-priced beverages. I knew he was lying, but there was no point in arguing. Shell out the 6000 yen to stay the night and I’m sure he’d lead me straight to the taps. I was not about to pay 500 yen for a 500ml bottle of water he’d probably filled at the hut, so I politely refused and continued the climb. And boy, what a climb it was. An exhilarating natural jungle gym of gargantuan slabs of rock. Follow the paint marks and try not to fall into the gaps between the boulders. I finally reached the high point, which barely had space for 2 people. 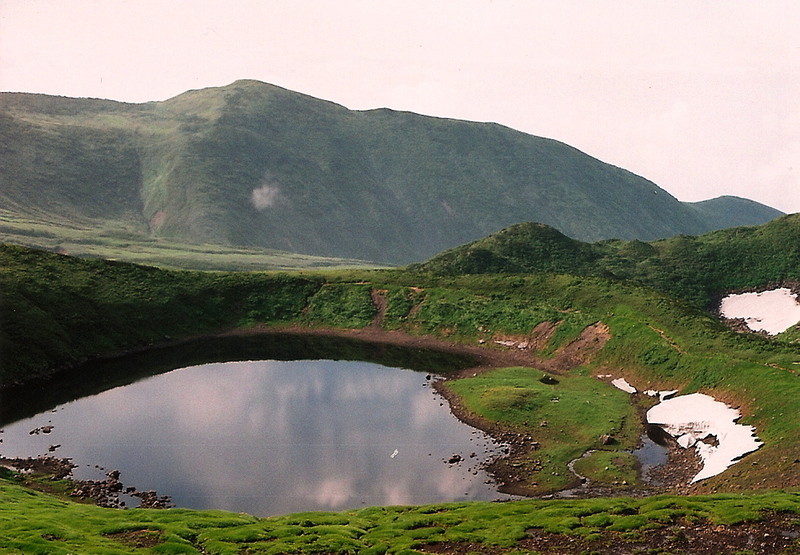 This was by far the narrowest summit of all of the Hyakumeizan, and here I was completely surrounded by a strange halo of cumulus clouds. Never in my life had I encountered such meteorological magic. The sun was shining directly above, but all around clouds were floating directly at eye level. Viewed from afar, one would assume that Chokai’s rocky flank were completely immersed in mist, but this was not the case. Dropping to the saddle between the twins, I broke out the water filter and started pumping fresh snow melt into my bottles. The sky never looked bluer. After refueling, I climbed, rather steeply, to the top of Mt. Shichikou, Shin-san’s less popular twin and sat for the better part of an hour. And why not? I had finally deserved to slow the pace down. It was my 6th mountain in only 5 days and it deserved my attention! The next hour was perhaps the most pleasant ridge walk I’ve done in Japan. I was completing the loop back to the lake where I started my morning and the unique flora were putting on a performance. Sprawling fields of Kisuge lilies dotted the landscape, while pockets of indigenous Chokai thistle and Chokai fusuma flowers basked in the afternoon warmth. Once back at the junction, I retraced my steps towards Ohama hut, turning left on a faint spur trail that wrapped its way around the scenic lake and through some rotting snow fields. Again, I filled up the bottles and leisurely reworked my way back to the trailhead and waited. Waited for what, you might ask? Well, for the sinking sun to turn Shin-san into a fiery inferno. 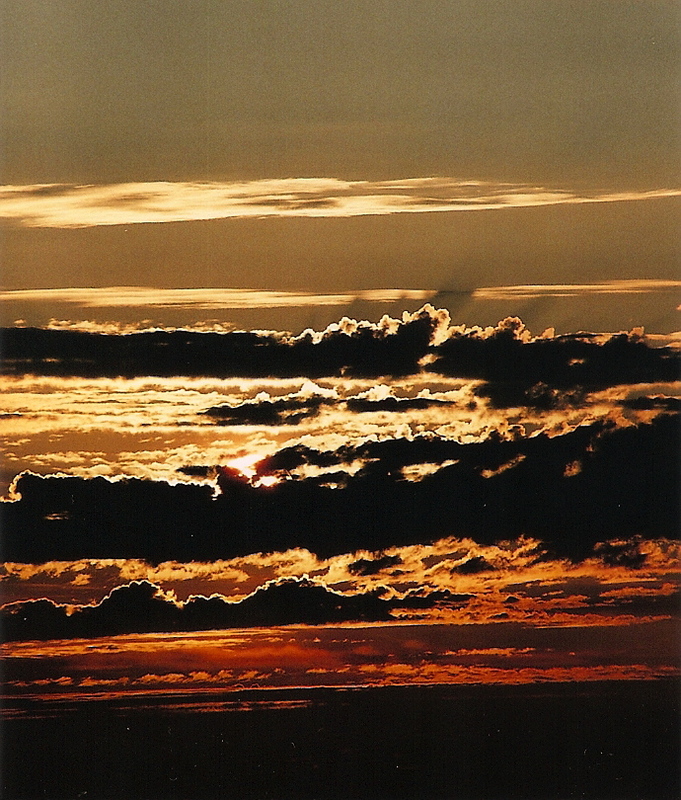 Further west, the cloud cover over the sea of Japan transformed the horizon into an artistic landscape. Tohoku couldn’t get much better than this. I slept like a log that night, knowing that the approaching low pressure system would finally give me an excuse to take a much needed day off. The following morning I could simply head to the castle town of Tsuruoka and spend the day planning for the three sacred peaks of Dewa-sanzan. From your description of the truculent hut employee, I had the pleasure of the same person. 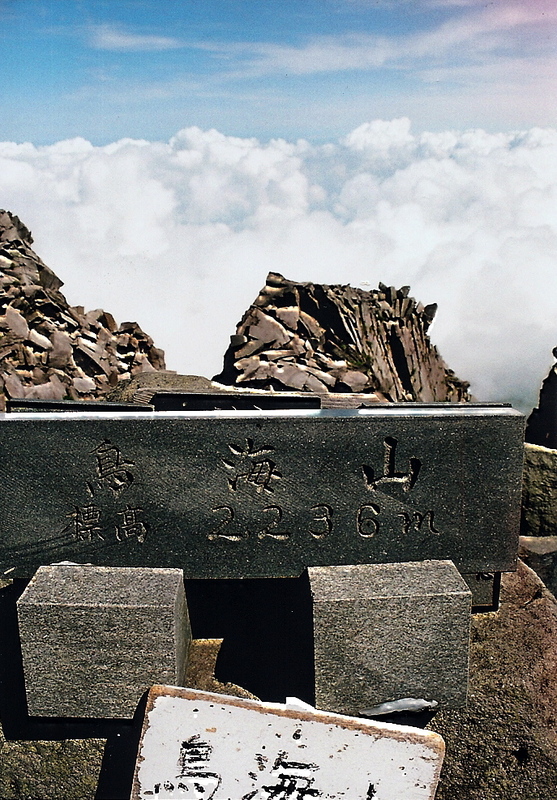 At the summit, did you see the names carved loudly into the rocks? I couldn’t fathom why anyone would carry a chisel and hammer up a mountain to do that.